The binary-ASCII code from Crabwood 2002: a second message embedded somewhere? 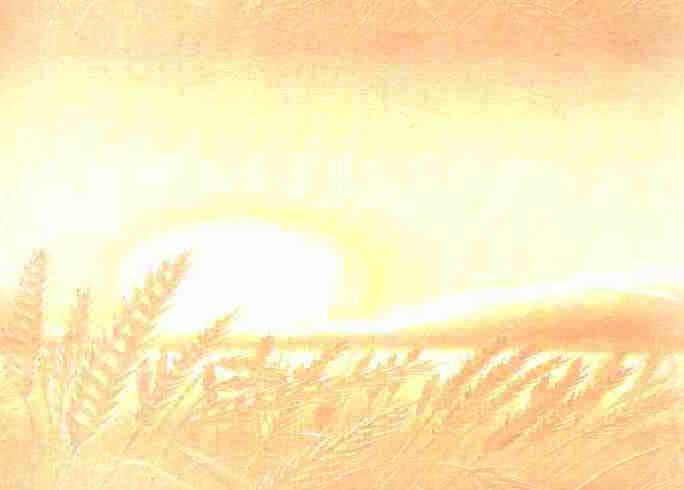 On August 15, 2002, a now-famous crop picture appeared at Crabwood in England. It showed the schematic image of a "military grey alien" using an old-fashioned 60-line TV signal from the 1950's, and also the image of a "spiral compact disc". and Paul Vigay (www.cropcircleresearch.com/articles/alienface.html) have already given excellent analyses of that particular crop picture, which was perhaps the most significant to date. "Beware the bearers of FALSE gifts & their BROKEN PROMISES.Much PAIN but still time.BELIEVE.There is GOOD out there.We oPpose DECEPTION.COnduit CLOSING\"
Taken on face value, that ASCII message would seem to: (i) warn us against any possible alliance with the military grey aliens, who may have promised (some governments in secrecy) advanced weaponry systems for nation-state warfare, that turned out later not to work; (ii) warn us that there will be much trouble on Earth in our short-term future; (iii) inform us that there are also good, spiritual extra-terrestrials hanging around Earth today, in addition to the nasty ones; (iv) inform us that they know about media lies and deception concerning the reality of modern crop circles; and (v) inform us that such messages are being sent to Earth by means of "space time conduit" technology, that we later saw depicted in the "wormhole" crop pictures from 2006 (see www.cropcircleconnector.com/anasazi/wormholetechnology.html). So far, so good! But could there be another level of information encoded within that long binary string of numbers, on some deeper level that they did not expect us to immediately understand? Indeed, could a second message be found now in 2008 upon closer scrutiny? Two anomalous features of their original binary code (see below) do seem to suggest a second level of information, not yet decoded. First, their ASCII text of 151 characters showed 52 examples of false capitalization, where the first three digits of any ASCII 8-bit letter were changed for no apparent reason from "011" to "010". At least two of those appear as the second letter in otherwise lower-case words ("oPpose" or "COnduit"). Details of their false-capitalization scheme seem to vary slightly from one analyst to the next, so I re-inspected the original crop photograph to produce a consensus as listed below. Any informed suggestions to further improve the accuracy of this binary consensus would be welcome. Secondly, their binary code contained 9 extra digits beyond what was necessary to supply 151 x 8 = 1208 digits of ASCII text, plus 151 half-width separators "S" for a total of 1359. Three of those extra digits lie on each end of the binary code to help start or end it correctly. But six others lie within the main text! Two of them create 9-digit "letters" as shown below, while one creates a 12-digit "letter" within the hard-to-read word "BELIE-0101-VE". Various "space", "period" or "ampersand" symbols have been labelled below in italics, to help the reader find "words" within different parts of the ASCII text by visual inspection. In order to help us better understand their Crabwood message, our crop artist friends also drew six other CD-like spirals in English crops during the summer of 2002. Some of these were: (i) a two-start spiral at North Farm on June 23; (ii) a nautilus-seashell spiral at Pewsey on July 17, (iii) another two-start spiral at Stanton on July 26; (iv) two overlapping arrowed-circles at East Field on August 14; (v) two connected-spirals at Ridgeway on August 18, or (vi) a DNA double helix at Crooked Soley on August 28 (see www.cropcirclearchives.co.uk, 2002 or www.lucypringle.co.uk/photos/2002/jun.shtml). All of those highly symbolic "double spiral" crop pictures would seem to suggest a second level of message within the Crabwood spiral CD, not yet elucidated. No obvious hidden "second code", but let's keep trying! Okay, guys, let's end all of this xenophobic, fearful denial and get serious. 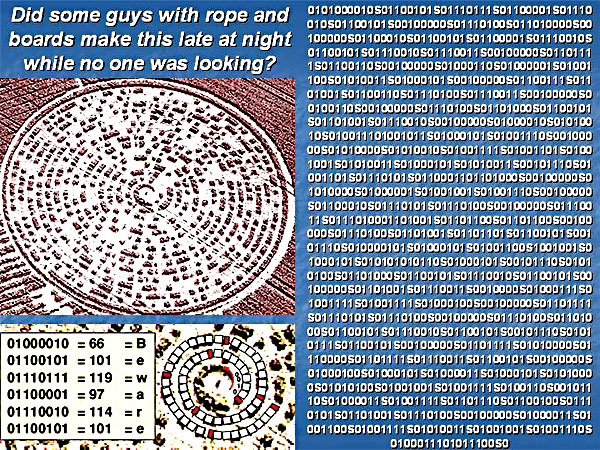 Does anyone really believe that two old guys with rope and boards made the 1368-digit Crabwood CD message by hand, late at night while no one was looking, and contrary to all other eyewitness accounts of its creation? You might as well believe in Santa Claus or the Easter bunny! I have already tried to find a second message within that Crabwood binary string using: (a) 5-bit, 6-bit or 8-bit character codes from our past (Baudot, CCITT2 or EBCDIC, see http://en.wikipedia.org/wiki/List_of_binary_codes); or (b) a reflected 8-bit binary code invented by Gray in 1947 (see http://en.wikipedia.org/wiki/Gray_code). Those early attempts produced little to no success, but then am not a computer expert. Spaces, periods or ampersands have been labelled in italics. 9 extra digits 0 or 1 have been labelled in bold italics. 52 examples of false capitalization have been labelled in bold. 50 of those are full-word, while 2 are second-letter (�oPpose� or �COnduit�). Other reported false capitalizations such as �But�, �Still�, �Oppose� or �OPpose� seem less likely upon careful examination of the original crop photograph. Revisions will of course will be considered if better evidence becomes available. P.S. These ideas were discussed at a recent crop circle workshop held in Narooma, NSW by the famous researcher Janet Ossebaard (see www.circularsite.com). They stirred so much interest there, that I was encouraged to make the complete binary code available to other researchers worldwide. A cryptic lowercase-capital letter code from Crabwood in 2002 may be interpreted most easily, if we assign an extra binary digit of �0� to each lowercase-letter word, and a binary digit of �1� to each capital or uppercase-letter word. Then we will have 25 extra binary digits to study as some sort of hidden code. The total number of �words� in its 1368-bit primary message was �25� (see time2007n). That is the product of two prime numbers �5� and �5�. 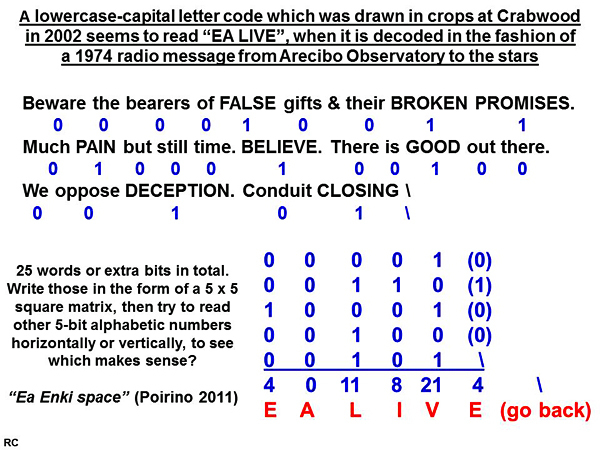 Now it seems logical that we should arrange those 25 extra binary digits in the form of a 5 x 5 square matrix, just as we expected unknown extra-terrestrials to arrange many other binary digits in a 1974 radio message from Arecibo Observatory to the stars! Following the example of that 1974 Arecibo radio transmission, we arranged our extra 25 binary �crop� digits into a square matrix of two prime numbers �5� and �5�. Then we looked carefully to see which arrangement made better sense? By this process, we found right away that a vertical reading of those extra digits as five (or six) numbers 4, 0, 11, 8, 21, 4 matches five (or six) letters of the English alphabet which spell �E A L I V E�, followed by a �backslash� symbol meaning �go back�. One interpretation of this newly-decoded message might be that �EA� (a god-scientist from ancient Sumeria) still �LIVES�, and that he is �going back� soon to planet Earth. Nine years later near Poirino, Italy, we saw a related message in binary ASCII which read �Ea Enki space�. That message suggested once again that �Ea Enki� is still alive, and somewhere out in �space� (see www.youtube.com). Any astronomers who work in the SETI program may wish to study these important crop-based messages further, if they wish to learn more.